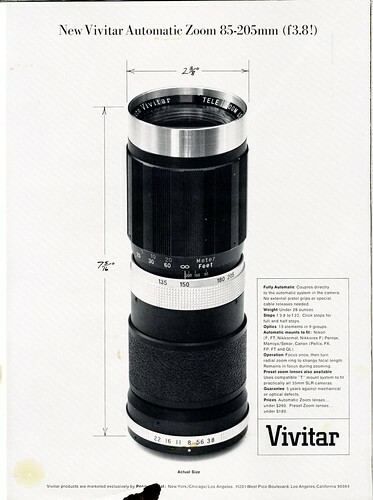 The Vivitar 85-205mm f/3.8 Zoom is one of the longest lived zoom lenses marketed by Ponder and Best (Vivitar). 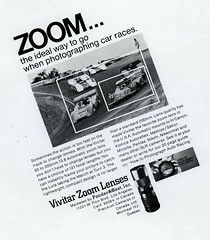 The first version of the lens was announced in the late 1960s, making it the very first zoom lens sold under the Vivitar badge. The last version was still being sold over a decade later. The exterior of the lens was modified multiple times to match the appearance of the Vivitar lens family it was marketed with; initially the Chrome Nose family, later the Bright Band family and then all black versions with metal or rubber focus rings to match later lens families. The earliest versions were also available as preset T Mounts and included in the Vivitar Compatible T System Family. The T Mount versions had an unusual marking on the preset ring of a red triangle. This marking signifies Kino Precision-made lenses that modern collectors refer to as the Pyramid Preset family. Most of the variations of the 85-205mm zoom were simply cosmetic changes to the exterior hardware but one of the last versions of the lens included internal changes to allow closer focusing. Based on serial numbers, a short production run of T mounts for each version occurred first, followed by continued production of automatics for the life of that version. There were 6 different versions of the lens. The first 4 versions came in both auto and preset variations, making a total of 10 different variations of the lens that are known to be marketed by P&B. 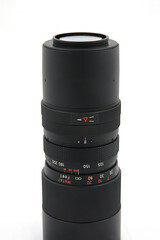 All versions of the lens are believed to have been manufactured by Kino Precision. The earliest models pre-date the standardized Vivitar serial numbers but all later models use the 22 prefix indicative of Kino Precision. 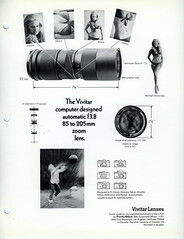 Because the lens was included in several different Vivitar lens families, crossed the serial number transition, and was heavily advertised, the lens is something of a Rosetta Stone for Vivitar researchers. Ads put definite dates on versions and mapping serial numbers to versions should help us pin down the exact date of Vivitar's serial number transition as well as date specific lens families more accurately. For these reasons, we maintain fairly extensive serial number data on this particular lens. Collectors believe Kino Precision also sold the same lens to many other distributors. 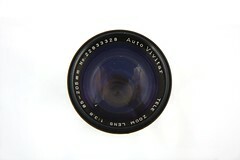 Variations of the lens have reportedly been sold as Soligor, Hanimex, Panagor, Albinar, Montgomery Ward, and other brands. 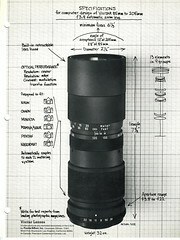 According to a Ponder and Best advertisement, the earliest version of the lens retailed for $260 USD in 1967. The same ad lists the preset T-Mount variant of the lens for $180. 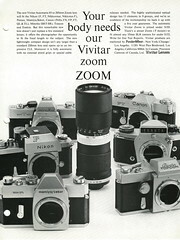 A February 1969 Modern Photography ad lists the Version 3 fixed mount auto for $195 USD and the version 3 T Mount for $152 USD, showing a significant price drop is less than two years. Versions 1 through 3 were very short-lived and are now quite rare, particularly the T Mount variants. 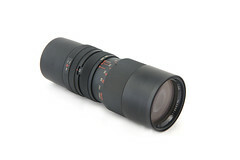 Later versions however are very common, leading to this lens being one of the most commonly available Vivitar zoom lenses on the used market. As a result of the large supply of used 85-205mm lenses, even the rarer versions have little resale value among modern collectors. It's unusual to see any variant sell for more than $10 USD today. The lens maintains focus at all magnifications. The instructions recommend that best focus will be achieved by focusing at 205mm and then zooming to the desired focal length. Maintenance issue. 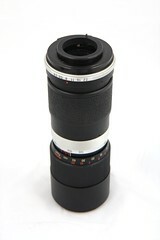 Early versions of this lens suffer from a common failure point. The zoom group housing is connected to the zoom control helical with a single, small nylon connector. 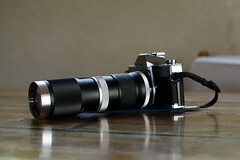 An impact, even one small enough to cause no obvious cosmetic damage, can easily break the nylon connector, rendering the zoom group unmovable by the zoom control. When evaluating a used lens, particularly older Chrome Nose and Bright Band versions, it's important to verify visually that the internal zoom group moves when the zoom control is turned. 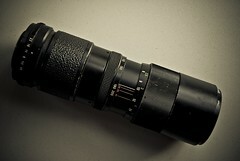 A lens with this type of damage can still be used but will be stuck at a single focal length. Repairing this damage requires removing the front lens group and focusing helical completely, which is problematic as any impact damage that breaks the zoom group can also damage the focusing helical just enough that, when removed, it cannot be reassembled. Expect to replace or recondition the focusing helical assembly as well in these cases. 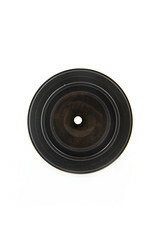 Given that the lens seldom sells for more than $10 USD, it's generally less expensive to buy another copy of the lens. The earliest preset T Mount version of the lens is based on the external design of the Chrome Nose family, with a silver ring at the front tip of the lens and a silver zoom ring with a diagonal diamond pattern. The focusing ring is metal with alternating longitudinal ridges and flats. The top section of bottom grip area is used for the aperture preset rings. The upper preset ring has a small window to show the preset aperture. The lower preset ring has a distinctive graphic showing a red triangle inside a white direction indicator. The remainder of the bottom grip area is smooth black metal. Collectors consider this lens a member of the Pyramid Preset family. The earliest automatic version of the lens is based on the external design of the Chrome Nose family, with a silver ring at the front tip of the lens and a silver zoom ring with a diagonal diamond pattern. The focusing ring is metal with alternating longitudinal ridges and flats. The bottom grip area has a bumpy plastic covering. Collectors consider this lens a member of the Chrome Nose family. The second version is identical to version 1 except the metal focus ring now has longitudinal ridges only, the flats are gone. 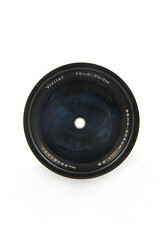 Collectors consider this lens a member of the Pyramid Preset family. The second version is identical to version 1 except the metal focus ring now has longitudinal ridges only, the flats are gone. 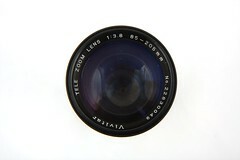 Collectors consider this lens a member of the Chrome Nose family. 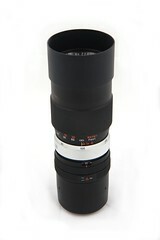 The third preset T Mount version of the lens is based on the external design of the Bright Band family. 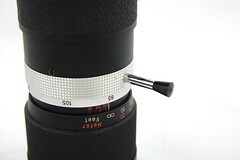 The Silver ring at the front tip of the lens has been removed to make room for a black built-in extendible lens hood. The silver zoom ring remains, matching the bright silver bands of the members of the lens family. The focusing ring is metal with longitudinal ridges. The top section of bottom grip area is used for the aperture preset rings. The upper preset ring has a small window to show the preset aperture. The lower preset ring has a distinctive graphic showing a red triangle inside a white direction indicator. The remainder of the bottom grip area is smooth black metal. 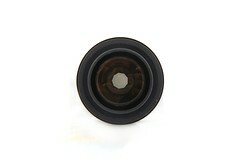 Collectors consider this lens a member of the Pyramid Preset family. 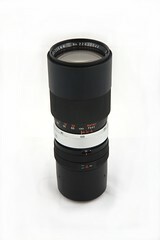 The third automatic version of the lens is based on the external design of the Bright Band family. The Silver ring at the front tip of the lens has been removed to make room for a black built-in extendible lens hood. The silver zoom ring remains, matching the bright silver bands of the members of the lens family. The focusing ring is metal with longitudinal ridges. The bottom grip area has a bumpy plastic covering. 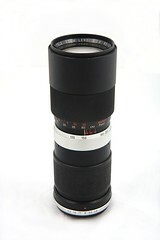 Collectors consider this lens a member of the Bright Band family. 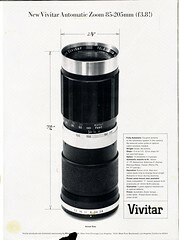 The lens is now all black, to match the coloring of the contemporary Vivitar lens family. The built-in lens hood remains, as does the metal focus ring with longitudinal ridges. The zoom ring now has a black diamond grip pattern. The top section of bottom grip area is used for the aperture preset rings. The upper preset ring has a small window to show the preset aperture. The lower preset ring has a distinctive graphic showing a red triangle inside a white direction indicator. The remainder of the bottom grip area is smooth black metal. 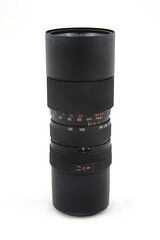 Collectors consider this lens a member of the Pyramid Preset family. Ponder & Best did no known advertising of the Version 4 T mount, instead focusing on the more popular automatic. It's likely that very few were made. 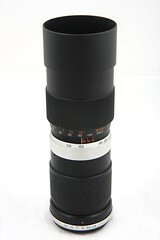 The result is that this is one of the rarest versions of this lens. So far, only a few of these have been documented, though others likely exist. 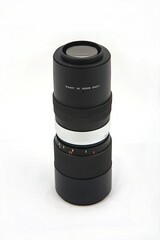 The lens is now all black, to match the coloring of the contemporary Vivitar lens family. The built-in lens hood remains, as does the metal focus ring with longitudinal ridges. The zoom ring is now has a black diamond grip pattern. The bottom grip area has a bumpy plastic covering. 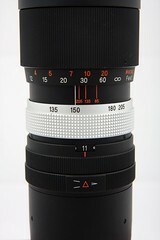 Most Version 4 lenses are automatics. The focus ring, zoom ring, and bottom grip area are all covered with black diamond grip rubber. Like previous changes, this allows the lens to match the contemporary Vivitar lens family. The exterior design is the same as Version 5 but there have been internal optical changes to allow close focusing. ↑ Wikipedia: idiomatic use of "Rosetta Stone"
This page was last edited on 9 June 2015, at 05:32.